We were home with Louella for about a day and a half. On Saturday morning we took Louella back to the hospital to get her jaundice levels checked. After the blood draw we came back home. We had sat down for maybe 30 minutes when Louella's doctor called and said her levels has risen to 21 and needed to be admitted to the NICU. They were waiting for us there. He told us to expect to be there at least 2 days. So we packed things up and headed back to the hospital. 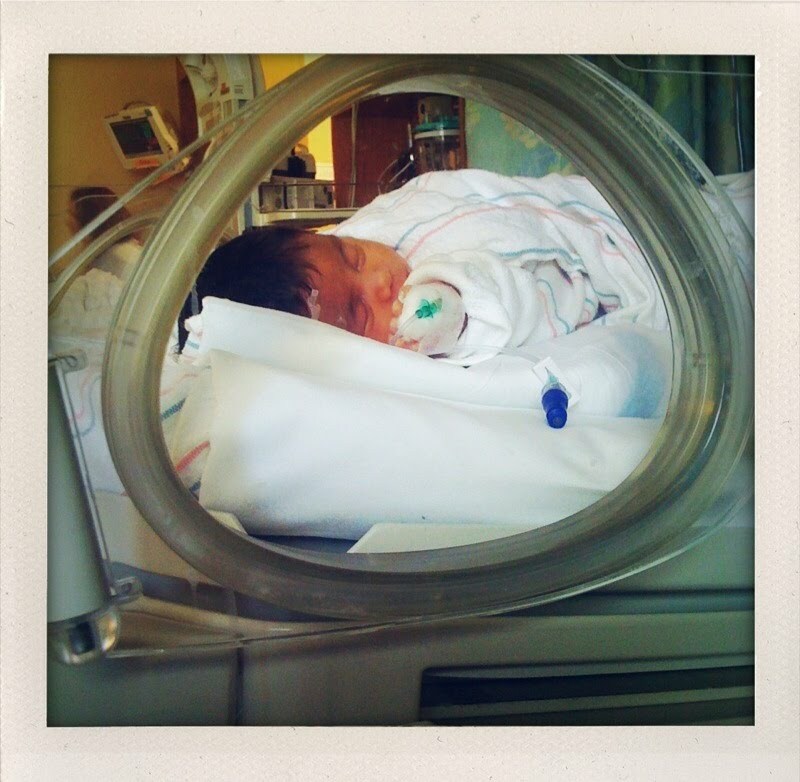 We walked into the NICU and the strange gas-like smell hit me in the face. We walked up to the info desk and told them who we were. Immediately 3 doctors came and took Louella, car seat and all from us. Things were moving fast and after they slapped ID bracelets on us they pulled out a digital camera. They had to take our photo for Louella's chart. It was like, "Your newborn has been admitted to the NICU, SAY CHEESE!" We saw the picture later and it was the most awkward photo of Joey and I ever. They sent us to the waiting room and would come and get us when Louella was settled. A resident doctor came in and began to explain to us that Louella was considered hyper-billie and would need to be under intense light therapy. Since her levels were so high and had been rising over the last few days they had done blood and urine tests to see if there was something else wrong that might be keeping her jaundice. Words like septic, meningitis and lumbar puncture were thrown around. They gave us all the rules of the NICU and had us sign a bunch of paperwork for just in case procedures. I was given a big bag of bottles for pumped breast milk. Finally we were able to go in to see Louella. She was stripped down to her diaper with the foam goggles over her eyes. She was under 3 lights and had an IV in each of her hands. The nurse Oksana answered all the questions that I could come up with. We only spent about an hour with Louella before it was time for a nurse shift change and we had to leave. When we came back we were told that Louella had been moved to a smaller NICU. A newer and much smaller NICU in the same area where my recovery room was. By the second day Louella's jaundice levels had dropped enough to take her off the lights. I was ready to take my baby home when a Nurse Practitioner came in to talk to us. Now imagine the worst thing you have ever gone through. For me it was back in 2003 when I was in the hospital for 5 days with viral meningitis. It was the most intense pain I have ever experienced. The lumbar punctures (spinal taps) were painfully and are something I hope to never have to go through again. Now imagine someone telling you that your newborn had a blood culture come back positive for meningitis and would have to have a lumbar puncture performed. I lost it. I held my brand new baby in my arms and for once did not care about the staff of nurses and the other parents in the room, and I cried. I have never been more terrified in my entire life. Although no one said it, I knew that meningitis was serious and many newborns die from it. We were told that the test would be done again because there was a good chance it was a contaminated test and it was a false positive. Of course those results along with the spinal fluid results would take at least 48 hours to come back. We were asked to leave the room while they performed the lumbar puncture. It was late in the evening, about 10:30pm and only took about 20 minutes but it was excruciating for us. Knowing what was happening. It took everything I had not to scream. We went back in and I held Louella close. She was sound asleep and our nurse reassured us that she barely even cried and the liquid extracted had been crystal clear. A good sign. A sign on meningitis is cloudy spinal fluid. After that it was a waiting game. When Sophia was born she stayed at the hospital for 2 days after I was discharged because of jaundice. I thought that was the hardest time in my life. This time was even harder. I cried when we left the house because I missed Sophia so much, and Joey had to drag me from Louella's bedside and at night I cried because I missed my baby. I was constantly having to rip my heart in 2. We spent almost every hour we could at the hospital. We took turns feeding her and holding her. Sometimes for hours at a time. I found a small place that allowed me half hour increments of quite and alone time. This place was the pumping room in the NICU. Every few hours I would take my breast feeding bag and head to the pumping room. The room was set up with 3 stations, with comfy chairs, foot stools a small table and a hospital grade pump. I would put my feet up and check my email and facebook. They had classical music piped in and the humming of the pumps was comforting at first. By day 5 the music was just annoying. It was getting harder to read facebook updates, life was going on while ours felt like it was standing still. During the day we were forced to leave between 9am and Noon and during that time we got breakfast and usually headed to the nearby Target. We strolled through the aisle, kid-free, and because of NICU policy even wedding ring free. It was like the old days when we were dating. I have had thoughts of "the good ol'days", before kids and mortgages. But that day there was nothing I wouldn't have given to have both Sophia and Louella with us at that moment. As the days went by we kept asking our nurse if the test results were still negative, and they were. We prayed that they stayed negative. And they did. By the 5th day Louella was clear of any meningitis scare and when we left all she had was a very slight and very common bladder infection. The saving grace of it all that my baby was never really sick and she was never in any pain, aside from all the IV's and spinal tap. Walking out of the hospital that day felt amazing. The amount of love and support we received from family and friends was amazing. I could have never made it through any of this without it, Joey was my rock through it all. Despite his stress and his emotions, he stayed strong for me. And Joey and I will never be able to thank my Mom for staying an extra week at our house to take care of Sophia. Not once did I have to worry if Sophia was being well taken care of. I knew she was in the best hands possible. Those 5 days were the hardest of my life. The thought of losing my newborn was impossible to wrap my head around, and the pain of seeing my little girl with IV's in her hands and feet was awful. But it has also left me so thankful for every day that Louella is here at home and every night I put her to bed in her own bassinet. OMG, how heart wrenching. I glad she's home, and doing well. I am so happy that Louella is home where she belongs. We went through the same thing with Hawk,2 spinal taps and a 2 week stint in the NICU. How terrifying. I am so glad there was a happy ending and that she is finally home with you. Nice blog, i really like the way you written, thanx for posting.